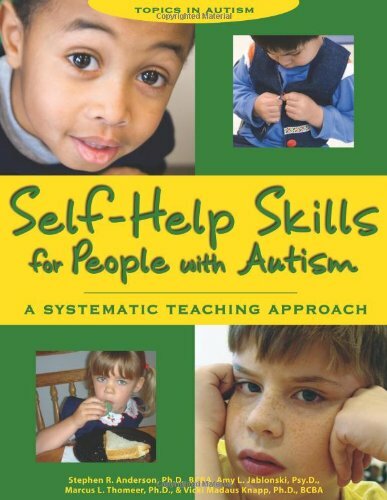 A comprehensive guide for children with autism that teaches basic self-help skills including communication and social skills, personal hygiene, and academic skills. Describes a systematic approach that parents (and educators) can use to teach basic self-care to children, ages 24 months to early teens. A chapter is devoted to each of the four skill areas (eating, dressing, toileting, personal hygiene) offering detailed insight and specific instruction strategies. Appendices contain forms to complete for task analyses, instructional plans, and data collection. Autistic children- Rehabilitation. Self-help techniques. Parents of handicapped children. Child rearing.